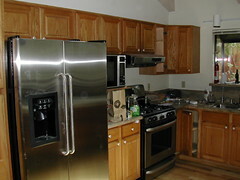 When we first saw this kitchen, it was 25 years old, it had oak doors and a see-through peninsula upper. 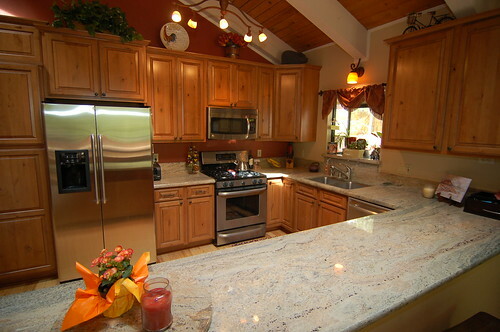 The upper cabinets were just 30″ tall but it had new granite countertops and the homeowners liked the layout. To complement the high vaulted ceilings, we replaced the uppers with 42″ tall cabinets, added a small cabinet over the existing pantry and refaced everything else. The wood is knotty alder and the color is Fruitwood with a Plantation glaze.